A healthy lifestyle helps bring you balance and supports your academic success. Nutritious eating, physical activity and restful sleep all contribute to healthy living. We recommend making small changes to integrate healthy habits into your daily life. Nourishing your body with a variety of foods gives you the energy to do everything on your to do list. Focus — Have you ever noticed how your mind wanders when you're hungry? Getting your essential nutrients from balanced meals and snacks can help you stay concentrated on your homework assignments, study materials, or course lectures. Move — Whether you're heading to the gym or walking up the stairs to class, fueling your body with nutritious foods can support your activity and improve your athletic performance. Feel Good — When your hunger is satiated after a balanced meal, you feel more energized and satisfied. This bears stark contrast to the "hangry” feeling we experience when we haven't eaten enough. Prevent Disease— Research shows that incorporating vitamins, minerals, and fiber into our daily eating patterns can promote a healthy immune system and even prevent development of chronic diseases such as diabetes and heart disease. It seems like everywhere we look; we're bombarded by nutrition messaging. But as you probably know, some sources are more credible than others. Read on to find evidence-based nutrition information from your FAU registered dietitian. Balance and variety are the cornerstones of nutritious eating. Different foods contain different essential nutrients we need to stay healthy and energized. To make sure we consume all these different essential nutrients, we eat a variety of foods. Eating balanced meals and snacks, that is, pairing foods from different food groups together, provides a variety of nutrients every time we eat. Keep in mind eating "healthy” shouldn't feel restrictive. If we eliminate certain foods or food groups entirely from our eating pattern, it makes it difficult to consume the variety of foods we need to stay healthy. Talk to a registered dietitian to learn more about consuming a balanced diet. ChooseMyPlate offers a visual reminder of the components of a balanced meal. 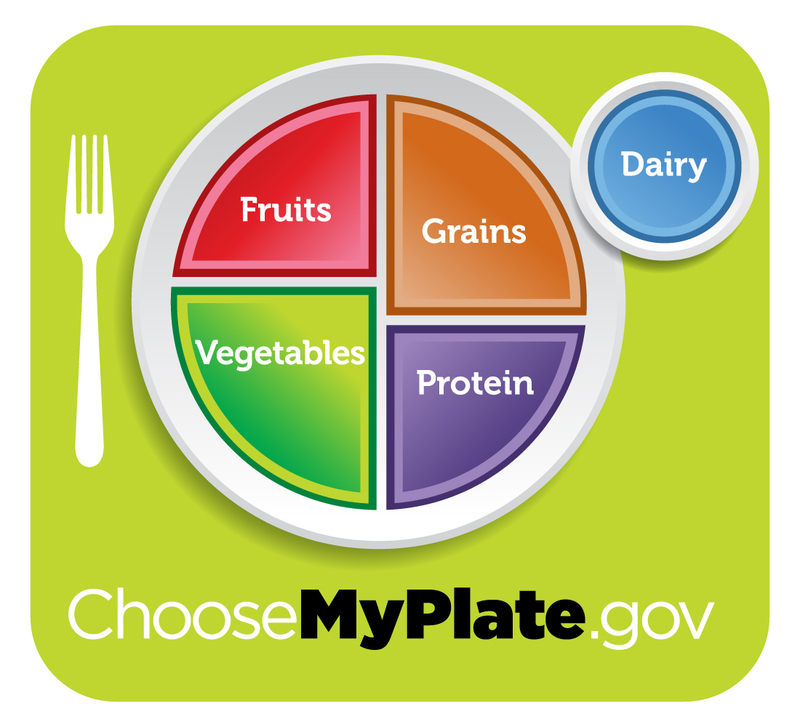 Visit ChooseMyPlate.gov to learn more about nutritious eating, or visit the next tab. "Make half your grains whole” – when choosing grains such as rice, pasta, bread, and cereal, look for options labeled "100% whole wheat” or "100% whole grain.” They will have more fiber than other grain options, which makes you feel fuller longer among other health benefits. "Move to low-fat or fat-free milk” –low-fat or fat-free dairy options can offer Vitamin D and Calcium to promote strong bones, as well as help meet your protein needs. These options won't have as much saturated fat as whole milk option, a nutrient that has been associated with development of heart-related conditions. "Make half your plate fruits and vegetables” – Eating whole fruits and a variety of vegetables provides many different vitamins and minerals to help keep you healthy. Different fruits and vegetables may have different nutrients, so don't be afraid to mix it up! "Vary your protein routine” – Plant-based protein sources, such as beans and nuts, as well as animal-based options, such as fish, lean poultry, and lean beef all have a place in a balanced diet. "Eat and drink the right amount for you” –This goes back to the concept of eating intuitively. Being in tune with your natural hunger and satiety signals can help you make sure you're meeting your specific needs. Working with a registered dietitian can also help you identify your body's specific nutrition requirements. Everyone’s body is different, so everyone has different nutrition needs. Read to figure out how to eat the right amount for you. The amount of calories and types of nutrients we need varies based on our age, activity level, height, and other health indicators. A registered dietitian can use equations and clinical judgement to estimate these values. He or she can also encourage you to eat intuitively, which can help you feel confident you’re making appropriate food choices. Keep in mind eating "healthy" shouldn't feel restrictive. If we eliminate certain foods or food groups entirely from our eating pattern, it makes it difficult to consume the variety of foods we need to stay healthy. Talk to a registered dietitian to learn more about consuming a balanced diet. (link to individual consultation page). Eating disorders are potentially life-threatening conditions that create unhealthy relationships with food. Need more nutrition-related information? Look no further! Nutrition is a science; this means with advances in research, our understanding of the foods we eat and the nutrients we need is constantly evolving. Here are some reliable resources you can use to stay up-to-date on nutrition information. Where you get your information matters—these sites offer evidence-based recommendations, strive to abide by ethical standards, and are committed to health promotion. When searching for nutrition information, government and university websites are often credible sources. You can get all of the benefits listed above by simply being active in ways that you enjoy. We want to take the focus off a "typical" fitness routine and reframe the way you see exercise. Any activity that gets your heartrate up and works your muscles counts as exercise. Need help coming up with ideas on how to get moving? Try out one or more of following activities and pay attention to how it makes you feel! Dancing: Zumba and Dance Fusion are just two ways you can incorporate dancing into your week at Campus Rec. Check out the schedule to find a class that meets your needs! Biking: Indoor and outdoor options are available for this heart pumping activity. 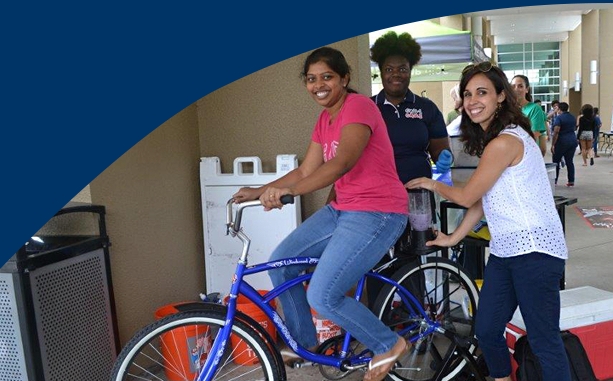 Try out the new indoor studio on campus or rent a bike and cruise on down to the beach for a more scenic route. Water sports: Take advantage of the ocean and intercostal being at your backdoor. Trying Stand Up Paddleboarding (SUP), surfing, or even just snorkeling with the fish. Rent all the gear you need at Outdoor Adventures on campus. Too much nature for you? Swim a few laps in the pool on campus! Walking: We often forget that walking counts as exercise! Take a stroll with friends around campus or on the beach. Count your laps on the track or just walk in circles around your place while you are on the phone with your friends and family. Group fitness: If you are looking for someone to motivate and encourage you through your workout, consider a Group Fitness class. There is something for everyone! Do you feel accomplished? Did your mood improve? Are you feeling more energized? Great! Tell us what activities you tried on social media or recommend your favorite ways to move so we can add them to the list! Food intake: too much or too little? Caffeine consumption: how much and how late in the day? Room temperature: too cold or too hot? Lights: how bright is your room? Sounds: too loud? Too quiet and you hear everything? All of these variables play a role on the quality of sleep you get and your ability to easily fall asleep. Want to learn more? Check out the National Sleep Foundation website and find out everything you wanted to know about sleep and its impacts. **Owls Care Health Promotion and FAU are not responsible for the content shared by these websites. Now click the next tab to find out how you can make positive changes in each area for a better night’s sleep. Pay attention to your hunger cues in the evening to make sure you are satisfied before trying to fall asleep. Too hungry or too full can leave you feeling uncomfortable and restless. Limit your caffeine in the afternoon. Be aware of how your body responds to caffeine intake and moderate it accordingly. Find a comfortable sleeping temperature. Experts recommend keeping your bedroom temperature around 65 to ensure quality sleep. If you share a thermostat, invest in a fan to moderate your room temperature. Light triggers your body to lower melatonin (sleep hormone) levels and increase your body temperature, waking you up or keeping you awake. Add curtains to your room to help your body’s natural sleep cycle to occur. Outside noise influences your quality of sleep. Consider a white noise machine or download White Noise Free app on your phone to block out sounds that disturb your sleep. Cozy up your bedroom by de-cluttering your room, rearranging your furniture, and choosing colors, blankets, a nd pillows that are soothing. Alcohol consumption makes it harder for you to sleep deeply and continuously through-out the night because it reduces the amount of time you spend in REM sleep. Avoid using it as a sleep aid and choose other relaxing activities to help you wind down. Find out what kind of sleeper you are by taking this short quiz! While getting 7 to 9 hours of sleep is the preferred recommendation, we understand that it does not always happen. On those nights you just don’t get enough sleep and are struggling to get through the day, consider a nap. The perfect nap is 20 to 30 minutes in the middle of the afternoon, preferably laying down or lounging in a cozy chair. If you are on campus and want to power up with a nap, check out our Wellness Map with some great, student recommended locations to take a break and catch some ZZZ’s.